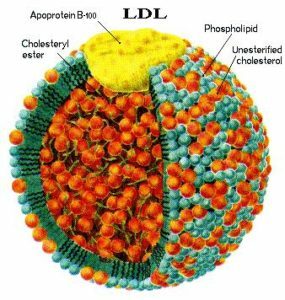 Apolipoprotein B (apoB) is the major protein component of chylomicrons, very low-density lipoproteins (VLDLs), intermediate-density lipoproteins (IDLs), lipoprotein(a) [Lp(a)], and low-density lipoproteins (LDLs), and constitutes 20-25% of the total weight of LDL. Overall, because of its much longer half-life (1.5-3 days), LDL comprises > 90% of the apoB-carrying lipoproteins. Theoretically, lipids derived from exogenous dietary sources are packaged in chylomicrons containing apoB-48, whereas endogenously produced lipids from the liver are packaged in particles containing apoB-100 (VLDL, IDL, LDL). The majority of absorbed cholesterol is of endogenous, not exogenous, origin. However, it is important to note that chylomicrons rapidly exchange their core lipids with all endogenously produced particles via cholesteryl ester transfer protein (CETP); hence, all particles carry endogenous and exogenous lipids. A critical distinction between apoB-100 and apoB-48 is that the latter is not a ligand for the LDL receptor. Because LDL particles contain one nontransferable molecule of apoB-100 and widely varying amounts of core cholesterol and triglycerides [a normally composed LDL has a ≥ 4:1 ratio of cholesteryl ester (CE) to triglycerides (TG)], apoB is a more reliable measurement of the relative number of LDL particles than is LDL-C. Furthermore, the very long half-life of LDLs means that they comprise more than > 90% of the circulating apoB particles; apoB is hence simply a marker of LDL-P, which is an indicator of the number of potentially atherogenic particles. ApoB-100-containing particles are cleared through the hepatic LDL receptor, which also recognizes apoE (but not apoB-48) and is thus also called the apoB/apoE receptor. The smaller or larger LDL particles, because of changes in the configuration of apoB, are not as readily cleared as normal-sized LDLs and their half-life is 3-5 days. Much of the risk related to small LDLs is their heavy contribution to total LDL-P. Furthermore, since small LDLs carry less cholesterol per particle, individuals with apparently normal LDL-C values can have discordantly high LDL-P or apoB levels and be at risk despite unremarkable LDL-C levels. Since the major criteria determining apoB-containing particle entry into the arterial wall is particle number, the higher levels of plasma apoB may signify increased coronary disease risk even when LDL-C is not elevated. For comprehensive cardiovascular risk assessment, because of the numerical association of apoB (90% of which represents LDL-P), it is important to consider the apoB and LDL-P metrics and remember that neither apoB nor LDL-P is reported in a standard lipid panel. It is also important to recognize that apoB is not an accurate measure of VLDL or remnant lipoproteins—it is a primarily a biomarker of LDL-P. It is well established that increased plasma concentrations of apoB-containing lipoproteins are associated with an increased risk of developing atherosclerotic disease.5-11 Case-control studies have found plasma apoB concentrations to be more discriminating than other plasma lipids in identifying patients with coronary heart disease (CHD). As mentioned above, apoB is a component of all atherogenic or potentially atherogenic particles, including chylomicrons and their remnants, VLDL and their remnants, IDL, LDL, and lipoprotein(a) [Lp(a)], and each particle contains one molecule of apoB. Therefore, apoB provides a direct measure of the number of atherogenic lipoprotein particles in the circulation. However, in normotriglyceridemic and hypertriglyceridemic patients the vast majority of total plasma apoB (over 90%) is associated with LDL, making apoB an effective surrogate for LDL particle concentration. Virtually all lipoprotein disorders associated with atherosclerosis are characterized by increased serum apoB concentrations. ApoB mediates the uptake of LDL particles by liver and peripheral tissue via a specific interaction with the LDL receptor. The pathological defect in FCHL is multifactorial, including VLDL overproduction, delayed catabolism and decreased LDL clearance, as the small size of the LDL particles renders them unrecognizable to the LDL receptor. Because apoB is directly involved with defects of LDL synthesis or clearance, it is expected to play a central role in diagnosis and monitoring of these disorders. Thompson and Danesh performed a meta-analysis of prospective studies of apoB and CHD.28 It is clear from this analysis that apoB is a significant predictor of cardiovascular disease with an overall relative risk of about 2.0 for the upper versus the lower tertile. Among the more compelling studies is the AMORIS Study because of the large number of subjects.29 More than 175,000 men and women over the age of 60 were followed up over a five-year period. 13-year follow-up of the Quebec Cardiovascular Study participants also suggested a similar synergy between LDL cholesterol and apoB.32 Among the men with elevated LDL-C and a low concentration of apoB (< 128 mg/dL), relative risk for CHD was a modest 1.5, but when both LDL-C and apoB were elevated the relative risk was 2.2. Of the 13 primary prevention studies that also provided data for LDL-C, only 9 reported a significant relationship between LDL-C and CHD in both men and women. Among the studies reporting both apoB and LDL-C, apoB was consistently the stronger risk factor. However, as the Quebec Cardiovascular Study and AMORIS have shown us, in large-scale studies with precise and standardized apoB measurement, apoB does appear to show statistically significant predictive effects even when traditional lipids and lipoproteins are covariates in the regression models. This is also evident in the Health Professionals Follow-up Study.38 When apoB and LDL-C were both simultaneously included in the model, relative risk for CHD was strongly associated with apoB while LDL-C and non-HDL-C were no longer statistically significant. Statins are highly effective in reducing serum cholesterol through inhibition of HMG-CoA reductase, the rate- limiting enzyme in cholesterol synthesis. Subsequent depletion of hepatic cholesterol pools leads to the upregulation of LDL receptors and hence to increased clearance of LDL particles from the circulation. The Air Force/Texas Coronary Atherosclerosis Prevention Study (AFCAPS/TexCAPs) demonstrated that apoB at baseline and after one year on therapy was a strong predictor of future cardiovascular events, whereas LDL-C failed to reach significance (P=0.05 at baseline and on therapy).41 The LIPID study provided similar results.32 The reason is clear: LDL-related risk is not captured by LDL-C measurement alone. Results from both primary and secondary statin trials suggest that on-therapy concentrations of apoB better predict future CHD events than does LDL-C.
Olofsson SO, Boren J. Apolipoprotein B: a clinically important apolipoprotein which assembles atherogenic lipoproteins and promotes the development of atherosclerosis. J Intern Med 2005;258(5):395-410. Knott TJ, Pease RJ, Powell LM, Wallis SC, Rall SC Jr, Innerarity TL, et al. Complete protein sequence and identification of structural domains of human apolipoprotein B. Nature (Lond) 1986;323:734–8. Teng B, Verp M, Salomon J, Davidson, NO. Apolipoprotein B messenger RNA editing is developmentally regulated and widely expressed in human tissues. J Biol Chem 1990;265(33):20616-620. Jeyarajah EJ, Cromwell WC, Otvos JD. Lipoprotein particle analysis by nuclear magnetic resonance spectroscopy. Clin Lab Med 2006;26:847–70. Stampfer MJ, Sacks FM, Salvini S, et al. A prospective study of cholesterol, apolipoproteins, and the risk of myocardial infarction. N Engl J Med 1991;325:373-381. Zambon A, Braun BG, Deeb SS, Brunzell JD. Genetics of apolipoprotein B and apolipoprotein AI and premature coronary artery disease. J Intern Med 2006;259:473–80. Willer CJ, Sanna S, Jackson AU, Scuteri A, Bonnycastle LL, Clarke R, et al. Newly identified loci that influence lipid concentrations and risk of coronary artery disease. Nat Genet 2008;40:161–9. Sniderman AD, Williams K, Contois JH, Monroe HM, et al. A meta-analysis of low-density lipoprotein cholesterol, non-high-density lipoprotein cholesterol, and apolipoprotein B as markers of cardiovascular risk. Circ Cardiovasc Qual Outcomes 2011;4(3):337-45. Otvos JD, Mora S, Shalaurova I, Greenland P, Macket RH, Goff DC. Clinical implications of discordance between low-density lipoprotein cholesterol and particle number. J Clin Lipidol 2011;5(2):105-113. Brunzell JD, Davidson M, Furberg CD, Goldberg RB, Howard BV, Stein JH, Witztum JL. Lipoprotein management in patients with cardiometabolic risk: consensus conference report from the American Diabetes Association and the American College of Cardiology Foundation. J Am Coll Cardiol 2008;15;51(15):1512-24. Burnett JR, Zhong S, Jiang ZG, Hooper AJ, Fisher EA, McLeod RS, et al. Missense mutations in APOB within the betaalpha1 domain of human APOB-100 result in impaired secretion of ApoB and ApoB-containing lipoproteins in familial hypobetalipoproteinemia. J Biol Chem 2007;282:24270–83. Tarugi P, Avema M. Hypobetalipoproteinemia: genetics, biochemistry, and clinical spectrum. Adv Clin Chem 2011;54:81-107. Nemati MH, Astaneh B. Optimal management of familial hypercholesterolemia: treatment and management strategies. Vasc Health Risk Manag 2010;6:1079-88. Liyanage KE, Burnett JR, Hooper AJ, van Bockxmeer FM. Familial hypercholesterolemia: epidemiology, Neolithic origins and modern geographic distribution. Crit Rev Clin Lab Sci 2011;48(1):1-18. Innerarity TL, Weisgraber KH, Arnold KS, Mahley RW, Krauss RM, Vega GL, Grundy SM. Familial defective apolipoprotein B-100: lowdensity lipoproteins with abnormal receptor binding. Proc Natl Acad Sci USA 1987;84:6919–23. Radar DJ, Cohen J, Hobbs HH. Monogenic hypercholesterolemia: new insights in pathogenesis and treatment. J Clin Invest 2003;111(12):1795-1803. Ewald N, hardt PD, Kloer HU. 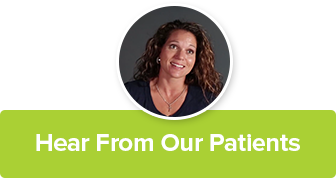 Severe hypertriglyceridemia and pancreatitis: presentation and management. Curr Opin Lipidol 2009;20(6):497-504. Schaefer JR. Unraveling hyperlipidemia type III (dysbetalipoproteinemia), slowly. Eur J Hum Genet 2009;17:541-542. Moon JY, Kwon HM, Kwon SW, et al. Lipoprotein(a) and LDL particle size are related to the severity of coronary artery disease. Cardiology 2007;108(4):282-9. Wierzbicki AS, Graham CA, Young IS, Nicholls DP. Familial combined hyperlipidemia: under-defined and under-diagnosed? Curr Vasc Pharmacol 2008;6(1):13-22. Veerkamp MJ, de Graaf J, Hendriks JCM, Demacker PNM, Stalenhoef AFH. Nomogram to diagnose familial combined hyperlipidemia on the basis of results of a 5-year follow-up study. Circulation 2004;109:2980–5. Thompson A, Danesh J. Association between apolipoprotein B, apolipoprotein AI, the apolipoprotein B/AI ratio and coronary heart disease: a literature-based meta-analysis of prospective studies. J Intern Med 2006;259:481–92. Walldius G, Jungner I, Holme I, Aastveit AH, Kolar W, Steiner E. High apolipoprotein B, low apolipoprotein A-1, and improvement in the prediction of fatal myocardial infarction (AMORIS study): a prospective study. Lancet 2001;358:2026–33. McQueen MJ, Hawken S, Wang X, Ounpuu S, Sniderman A, Probstfield J, et al., for the INTERHEART study investigators Lipids, lipoproteins, and apolipoproteins as risk markers of myocardial infarction in 52 countries (the INTERHEART study): a case-control study. Lancet 2008;372:224–33. Lamarche B, Moorjani S, Lupien PJ, et al. Apolipoprotein A-1 and B levels and the risk of ischemic heart disease during a 5 year followup of men in the Quebec Cardiovascular Study. Circulation 1996;94:273-8. St-Pierre A, Cantin B, Dagenais GR, et al. Low-density lipoprotein subfractions and the long term risk of ischemic heart disease in men: 13-year follow-up data from the Quebec Cardiovascular Study. Arterioscler Thromb Vasc Biol 2005;25:553–9. Simes RJ, Marschner IC, Hunt D, Colquhoun D, Sullivan D, Stewart RAH. Relationship between lipid levels and clinical outcomes in the long-term intervention with pravastatin in the ischemic disease (LIPID) trial: to what extent is the reduction in coronary events with pravastatin explained by on-study lipid levels? Circulation 2002;105:1162–9. Benn M, Nordestgaard BG, Jensen GB, Tybjaerg-Hansen A. Improving prediction of ischemic cardiovascular disease in the general population using apolipoprotein B: the Copenhagen City Heart Study. Arterioscler Thromb Vasc Biol 2007;27:661-70.
van Lennep JE, Westerveld HT, van Lennep HW, Zwinderman AH, Erkelens DW, van der Wall EE. Apolipoprotein concentrations during treatment and recurrent coronary artery disease events. Arterioscler Thromb Vasc Biol 2000;20:2408–13. Otvos JD, Collins D, Freedman DS, Shalaurova I, Schaefer EJ, McNamara JR, Bloomfield HE, Robins SJ. Low-density lipoprotein and high-density lipoprotein particle subclasses predict coronary events and are favorably changed by gemfibrozil therapy in the Veterans Affairs High-Density Lipoprotein Intervention Trial. Circulation 2006;113:1556–63. Pischon T, Girman CJ, Sacks FM, Rifai N, Stampfer MJ, Rimm EB. Non-high density lipoprotein cholesterol and apolipoprotein B in the prediction of coronary heart disease in men. Circulation 2005; 112:3375–83. Sniderman AD. Differential response of cholesterol and particle measures of atherogenic lipoproteins to LDL-lowering therapy: implications for clinical practice. J Clin Lipidol 2008;2:36–42. Walldius G, Jungner I. Apolipoprotein B and apolipoprotein AI: risk indicators of coronary heart disease and targets for lipid-modifying therapy. J Intern Med 2004;255:188–205. Gotto AM, Whitney E, Stein EA, Shapiro DR, Clearfield M, Weis S. Relation between baseline and on-treatment lipid parameters and first acute major coronary events in the Air force/Texas Coronary Atherosclerosis Prevention Study (AFCAPS/ TexCAPS). Circulation 2000;101:477–84.